Everyone (probably mostly moms) freaking love Target and I am there probably 2-3 times a week and way more than my Hubby would like. But Adie totally thinks we got her from Target and everything completely awesome comes from that store so it fits! It literally is like a mini vacation when I go by myself and I can fit even more in the cart. Last week I went twice in two days because pushing a cart with Adie in the front and Aden in the basket in his car seat leaves very little room for groceries and have to haves. If you follow us on Instagram (@adieandaden) you totally know what made it with us on the first trip and it was so worth it plus it was on sale. Which I tell my Hubby all of the time but it really was ;) love you babes if you're reading this! But your kids rooms are about to get much stinking cuter. Target's sneak peek into their pillowfort collection is REALLY REALLY GOOD. On sale starting February 22 in store and online and I will be at our store with both kids and an extra cart. It's called pillowfort and you can get a preview of the collection if you search that term in the site or here. 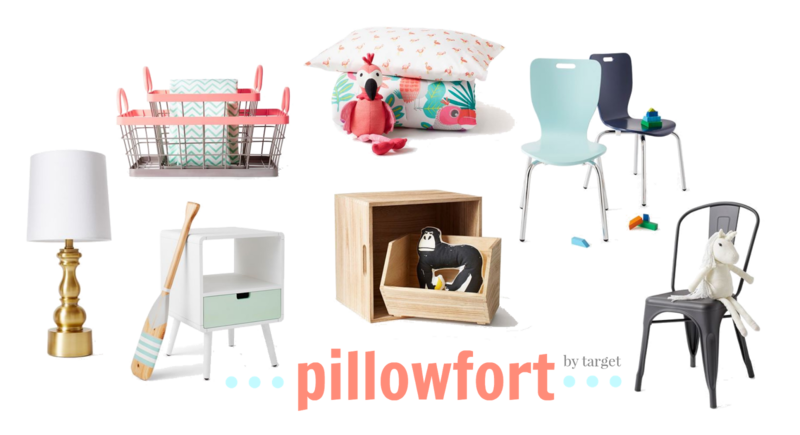 Pillowfort kids home is bright, fun and perfect for my two little people and making their room a little more their style. For every dreamer and make-believer, this room is paradise at home ... how perfect is that?! Happy previewing guys! You'll love it. Promise! XO! p.s. let me know what's your favorite!